This guide to using EEBO was one of several guides written for students by students working under the supervision of Dr. Kristen A. Bennett. These how to resources for conducting digital, archival, and worldwide library research across topics in early modern English literature were created by undergraduate students in the Spring 2014, ENG 304 class, Subversion and Scandal in Early Modern Print Culture with the help of the Faculty Initiatives in Technology grant at Stonehill College. Dr. Bennett and her students kindly gave MoEML permission to republish their guides. Click here for guides to Early Broadside Ballad Archive, the Folger Digital Image Collection, Project Gutenberg, and the Internet Shakespeare Editions. To see the guides in their original context, along with other materials, visit the English 304 blog. Graphic from the EEBO home page. Early English Books Online (EEBO) is a database that allows users to browse through scans of early modern texts. EEBO contains digital facsimiles of virtually every work printed in England, Ireland, Scotland, Wales and British North America, as well as numerous texts published between 1473 and 1700 that were printed in a variety of other countries, a total of over 125,000 titles. Many graduate scholars often frequent the site across many different disciplines including English literature, history, philosophy, linguistics, theology, music, fine arts, education, and science (EEBO). First, access EEBO via your university library website. Some libraries will list EEBO alphabetically under online resources or include it under the databases tab of the library site. Ask your reference librarian for help. On the left-hand side menu of EEBO, there are five tabs available to you. 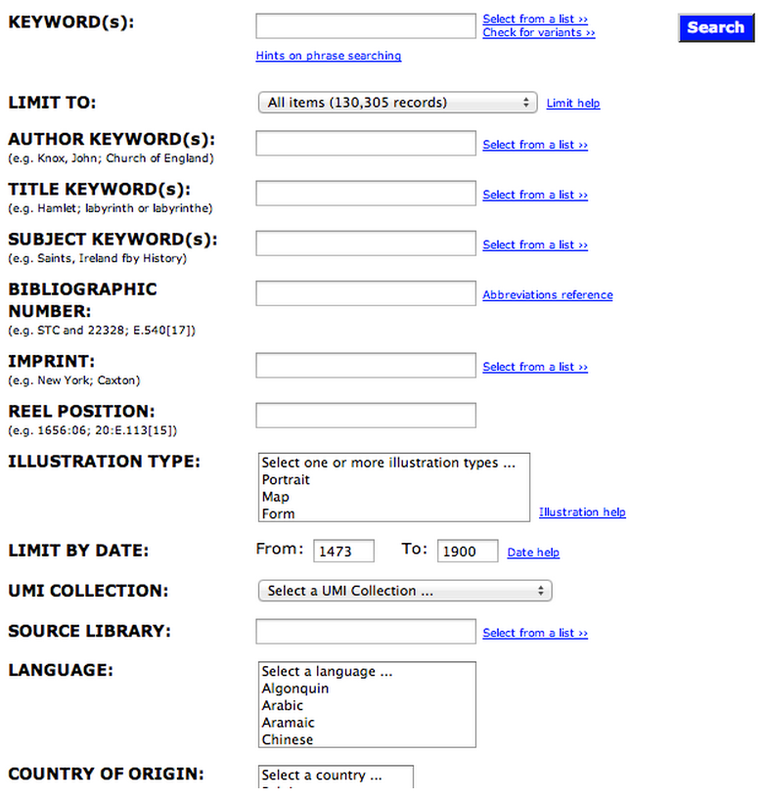 Screen capture of the EEBO search page. Open the search tab to find early books that match specific keywords and attributes. If you are looking for a specific book, enter the information you have about the book into the corresponding search fields (e.g., author, keywords, title keywords, bibliographic numbers, etc.). Once you have completed the search form, press search to view your search results. Using the drop-down menu at the top of the page, you can sort results alphabetically by author or year, or chronologically by earliest date of publication or latest date of publication. By clicking advanced in the upper-left corner of the site, you can perform an advanced search. By providing more search fields, the advanced search usually generates fewer and more relevant results. Search fields in the advanced search form include year or time period, language, country of origin, illustration type, UMI collection number, etc. Open the browse tab to view all collections written by a specific author. Type in the author’s name, or the first few letters of it, and press look for. Once you have found the text you want, click on the first paper icon ( ) to see record information about the text, including the title, author, date, and notes. Click on the camera icon ( ) to see full-size images of the text, starting with the first page. Click on the ink dropper icon ( ) to see illustrations in the text, including portraits and charts. Click on the second paper icon ( ) to see a transcription of the text, if available. Finally, click on the camera/paper icon ( ) to see thumnails for each page of the text. The about tab helps answer any questions or solve any issues you may have while browsing EEBO. Open this tab to look at frequently asked questions or basic ideas regarding the site. The information resources tab leads to a password protected section of the site for librarians and administrators. Students may ignore this tab. Open the what’s new tab to learn about recently added content, such as books, images, transcriptions, etc. Stonehill College English 304 Spring 2014 Students. How to Use Early English Books Online (EEBO). The Map of Early Modern London, edited by Janelle Jenstad, U of Victoria, 20 Jun. 2018, mapoflondon.uvic.ca/EEBO_guide.htm. Stonehill College English 304 Spring 2014 Students. How to Use Early English Books Online (EEBO). The Map of Early Modern London. Ed. Janelle Jenstad. Victoria: University of Victoria. Accessed June 20, 2018. http://mapoflondon.uvic.ca/EEBO_guide.htm. Stonehill College English 304 Spring 2014 Students. 2018. How to Use Early English Books Online (EEBO). In J. Jenstad (Ed), The Map of Early Modern London. Victoria: University of Victoria. Retrieved from http://mapoflondon.uvic.ca/EEBO_guide.htm. Student contributors enrolled in English 304: Subversion and Scandal in Early Modern Print Culture at Stonehill College in the Spring 2014 session, working under the guest editorship of Kristen Abbott Bennett.